I went all out for Father's Day dinner for Mr. I charcoal grilled burgers and shrimp which we had with a homemade cocktail sauce, I also made these steak fries with this ketchup and a garlic aioli. I was most excited for the ketchup, which I had a little of for my fries before they cross contaminated it with their burger buns. =( Luckily it's easy to make, and I'll be making it double to have on hand next time. I really like it, it's not too sweet (I did use less sugar than the original said, because of the honey), it's a little zesty but still mild tasting. I even used some of it in the cocktail sauce recipe. Combine all the ingredients in a medium saucepan over medium heat; whisk until smooth. When it comes to a boil, reduce heat to low and simmer for 20 minutes, stirring often. 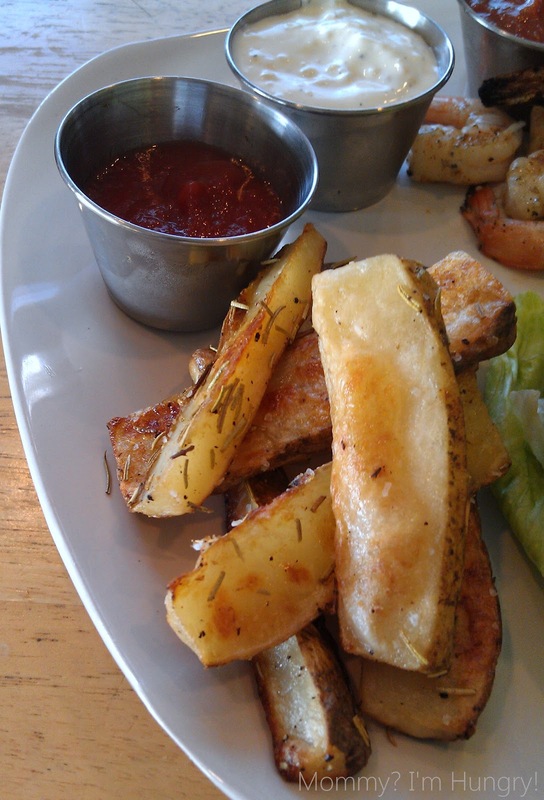 These fries came out great too, they're pretty much like roasted potatoes. I used the homemade ketchup and the garlic aioli sauce to try with my fries. Both were delish. Preheat the oven to 400 degrees and leave the baking sheet you will use in the oven. Put cut potatoes in a bowl and drizzle on the olive oil, make sure they are well coated. Put in salt, pepper and the herbs. Mix well with hands and put on preheated baking sheet making sure they are in a single layer. Bake for around 45 minutes, depending on your oven, until they are golden brown and really crispy. I turned them over about 25 minutes into cooking to crisp the other sides. When done, remove from over and sprinkle garlic powder over them. Whisk with all the ingredients in a small bow and then let sit for a few minutes. Refrigerate if not using right away. those steak fries look UH-MAZING!! :) perfect with homemade ketchup! I'm for making my own ketchup. Thanks for the recipe! I pinned it to save and share. Nice ketchup recipe! I'm saving it for my files. I just happened to be looking at a recipe on my blog for butternut squash soup with maple syrup and saw that you had left a comment back in 2008 that went unanswered (you used to live in Humboldt county where I live now). It was a sweet comment and I'm so glad you're a blogger - with a great blog, I might add - so that silly as it seems, I am finally able to say thanks! Do you know of any recipes for homemade ketchup that do not require salt? This is really the first homemade recipe I've come across so I can't say that I have seen any. You can try it without adding it and see how it tastes to you, but I think the tomato paste would have some sodium as well (unless you can find a low sodium kind).